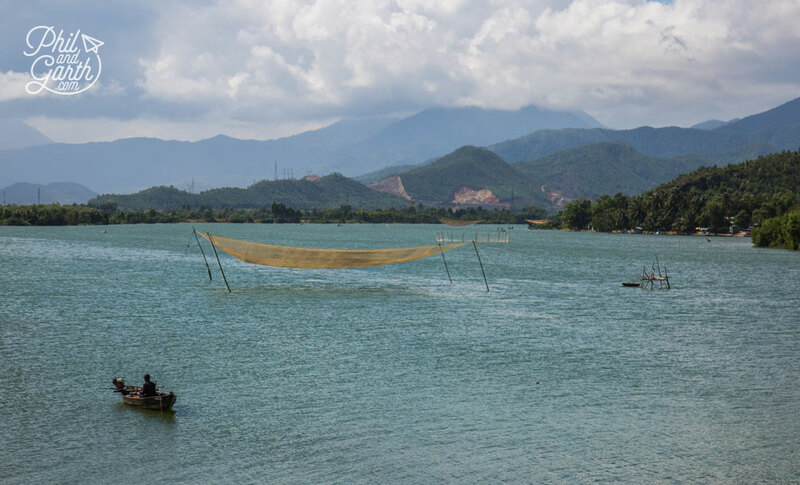 Continuing our tour through Vietnam we left Hue and took to the scenic road along the National Highway One, south to Hoi An which took around 3 hours. 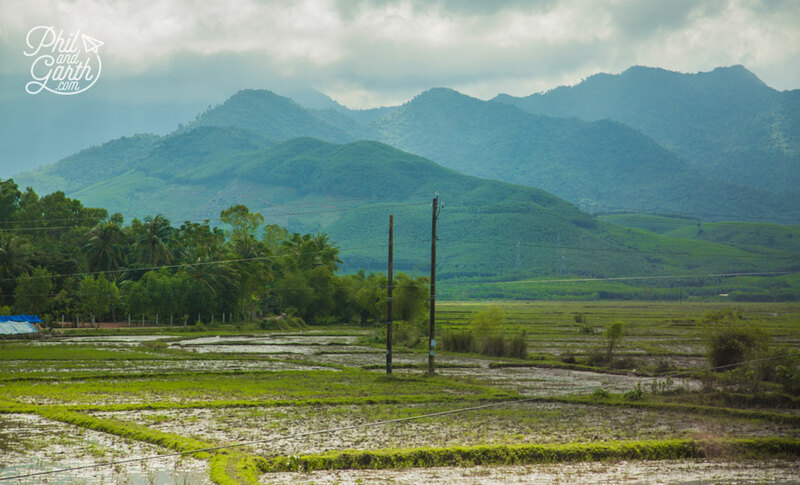 The drive took us past wonderful countryside and was slightly hair raising at times as we zig zagged our way up and down the mountain pass – Hai Van Pass for a short stop at Da Nang. The Hai Van Pass was featured in the BBC’s Top Gear Vietnam Special, Jeremy Clarkson said it ‘was one of the best coast roads in the world’ Incredibly scenic, just don’t look down too often! 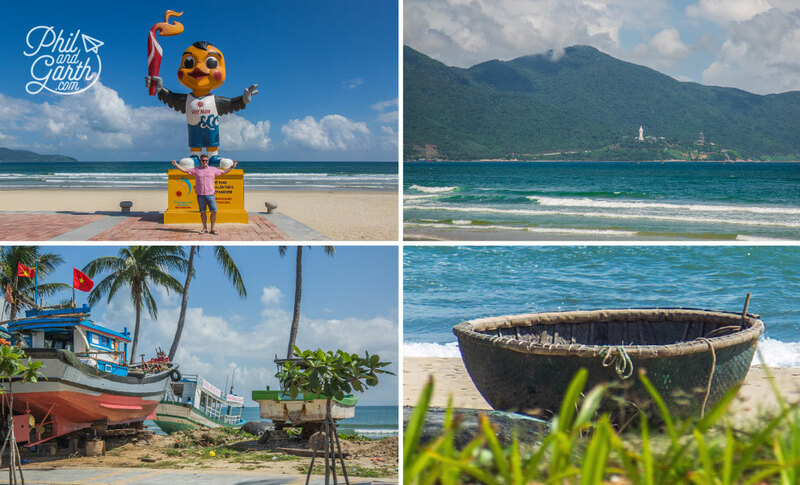 Da Nang is Vietnam’s 4th largest city, a popular resort town with visitors from South East Asia. It’s a very nice place neither polluted or crowded. 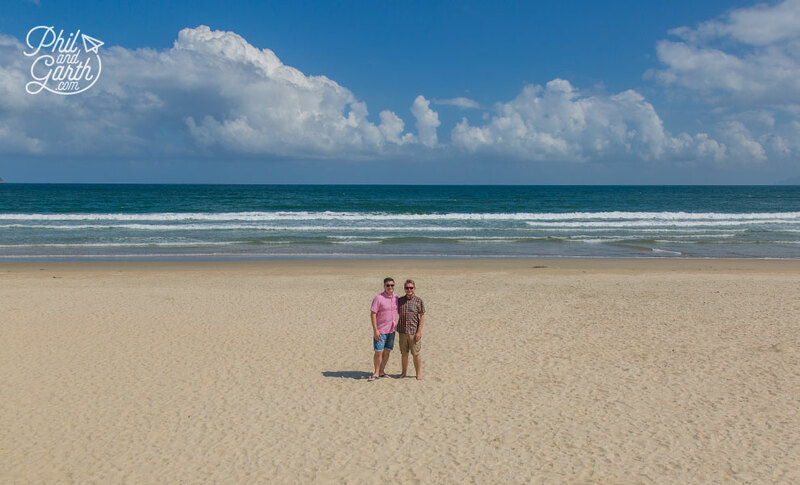 We stopped at the immaculate beach – My Khe which was made famous during the Vietnam War by the American Forces. It was their place for rest and recuperation, who nicknamed it ‘China Beach’, but don’t use that phrase anymore as it’s considered disrespectful. Phil went for a paddle in the sea and said it was the warmest he’s ever experienced, it had strong currents on the day we were there, so swimming was not allowed. 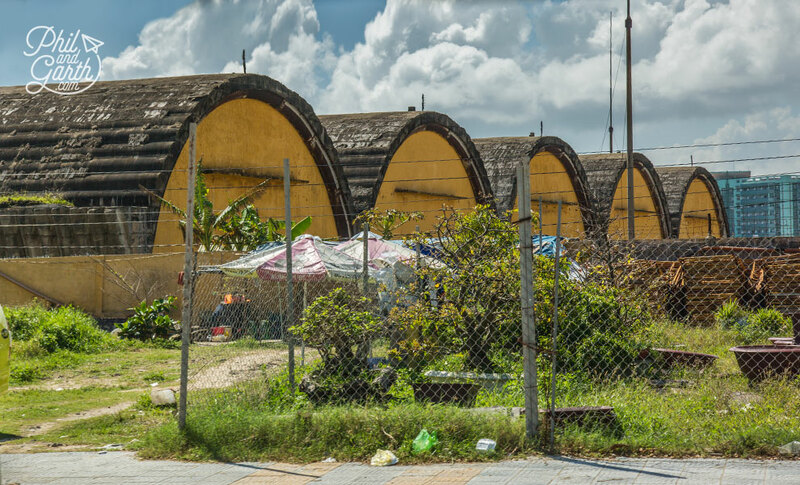 On the road out of Da Nang, not far from Marble Mountain we saw some of the old US army airbase hangars which appeared to be intact. 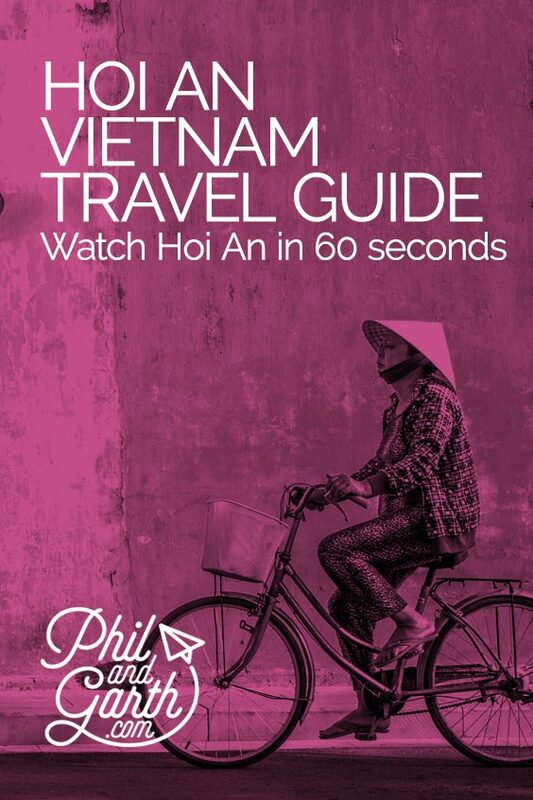 Hoi An was just another 30 minutes away from here, we were now excited! 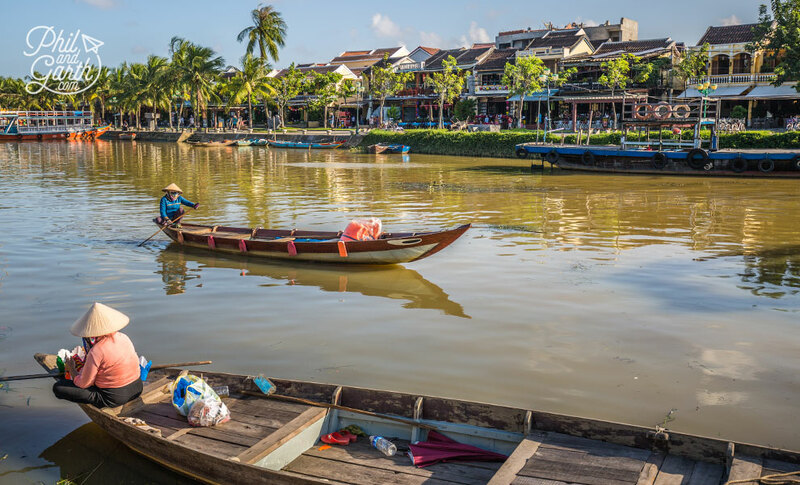 The small coastal town Hoi An once traded in silk and spices, a prosperous place it was an important trading port in the whole of Asia until the River Thu Bon silted up and trading moved to nearby Da Nang. 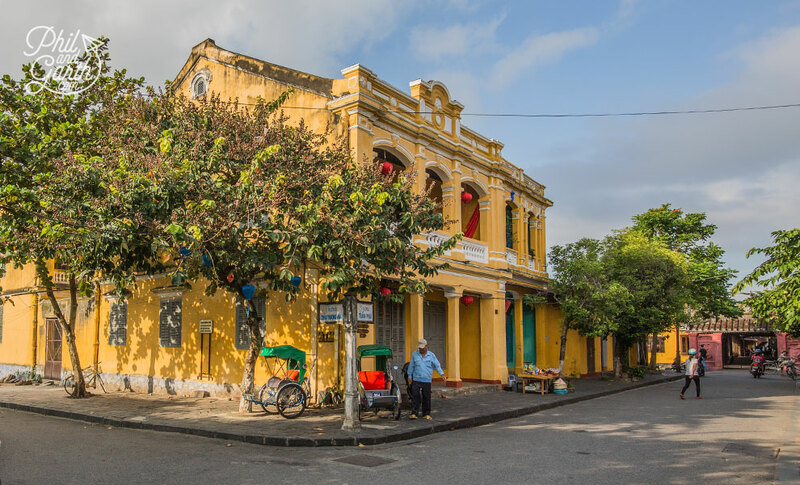 The Old Town appears romantically frozen in time as all the whole town is incredibly well preserved unlike other Vietnamese cites, which have undergone mass development. The fact it’s so well intact is what makes it picturesque and a pleasure to visit. 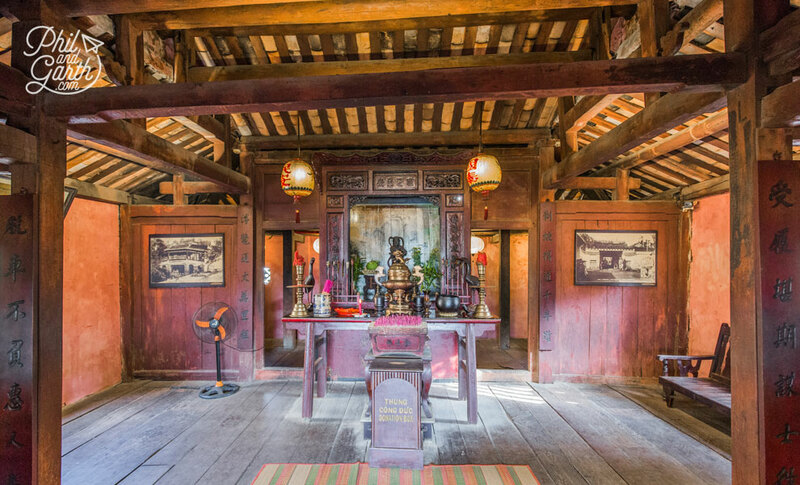 The architecture is a blend of Vietnamese, French colonial, Dutch, Chinese and Japanese influences. Buildings are now restaurants or shops catering to tourists, as we explored we really did feel like we were in the past, the whole town is like a living museum. Hoi An’s ancient Old Town is also a Unesco World Heritage Site so you have to pay once for a ticket to access the 22 streets (traffic is banned during the day) The ticket gives you access to 5 of the main sights, however you can use your ticket as many times as you want to enter the Old Town. 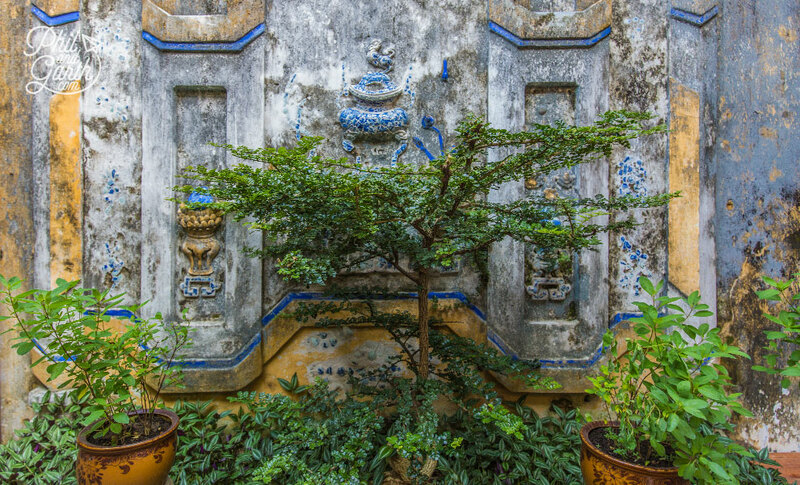 Hoi An reminded us of our visit to Havana, where the faded colours look like photos straight from an Elle Decoration coffee table book. Garth loved the distinctive yellow colour palette around the Old Town and the distressed textures of paint crumbing away in the sunshine. 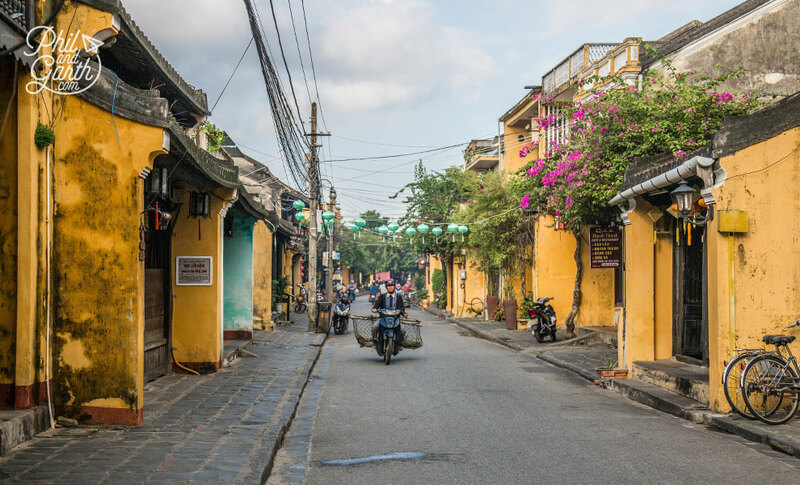 The other thing we noticed was just how clean Hoi An is compared to Hanoi, streets don’t have rubbish scattered around and the streets don’t smell. Instead you pass aromas of incense one minute, freshly baked baguettes or the smell of lemongrass which is really nice. 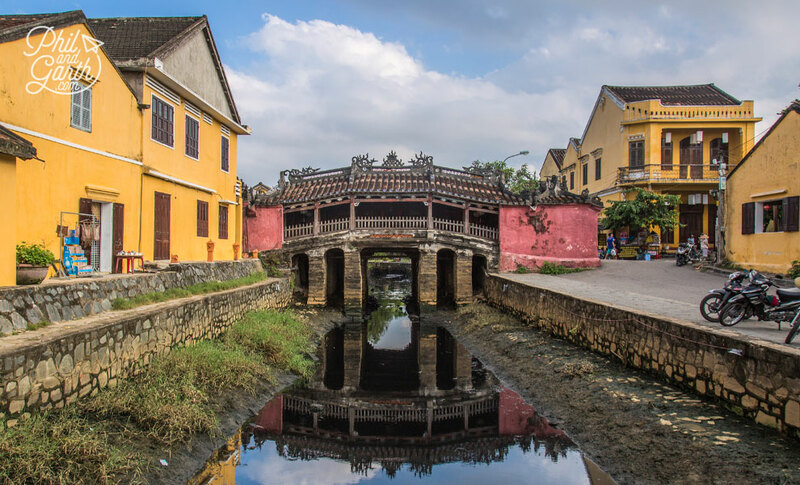 Standing for over 400 years is the Japanese Covered Bridge – It’s Hoi An’s must see landmark. Built in the 18th century to join the former Japanese quarter with the rest of the town. We used our ticket to cross the bridge and have a look at the small temple inside. 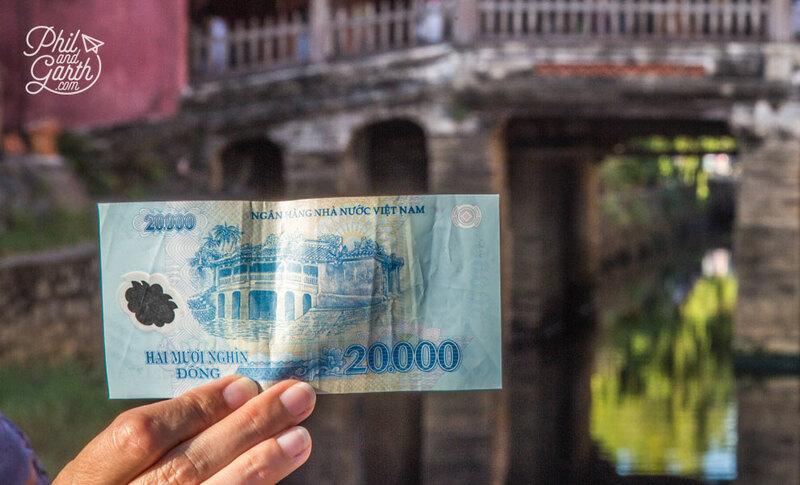 It also features on the 20,000 Dong banknote, and looks great at night too. However this isn’t the only Japanese bridge in Vietnam, we saw another one in the countryside outside Hue. 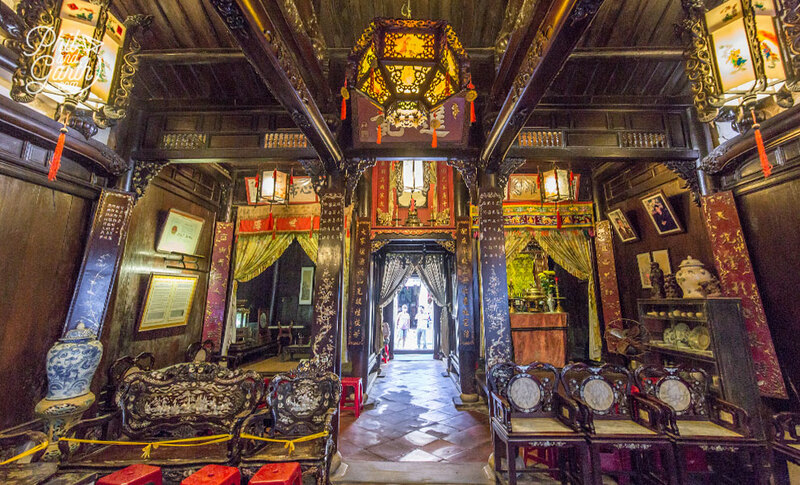 Tan Ky is a perfect example of a wealthy merchants house. 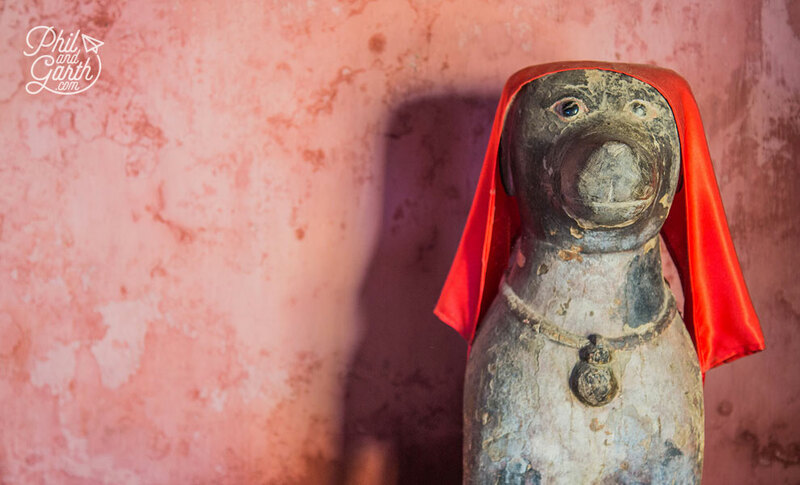 It’s over 200 years old and has been passed down 7 generations, who keep everything presented exactly as it was. The house often gets flooded every year, there’s photos and markings on the wall to show this. In December, the month after we went the whole town was flooded, we watched pictures on Facebook of people navigating the narrow streets on boats. 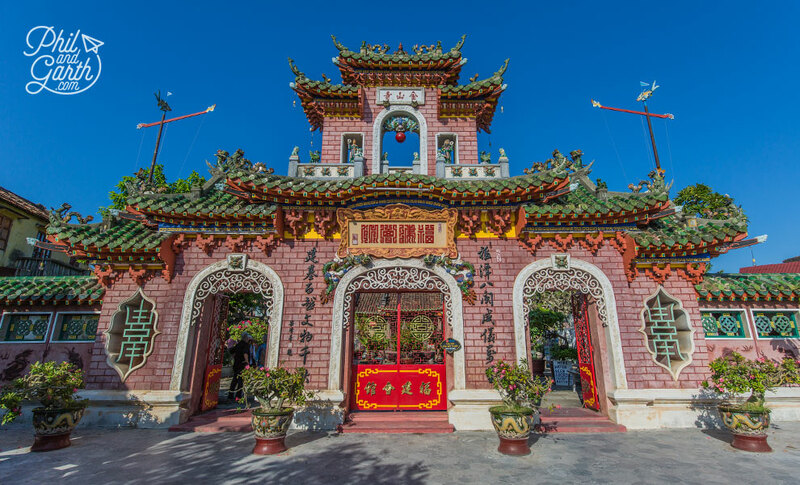 There are 5 Chinese assembly halls in Hoi An, we went to one of them – Phuoc Kien. 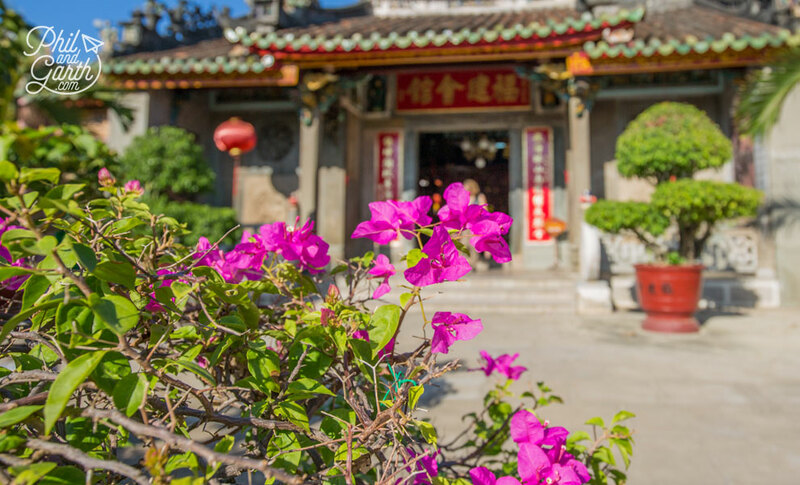 Assembly halls were built by Chinese migrants when they settled in new countries to keep their traditions alive for their next generation. Primarily it was a place for them to socialise and worship. 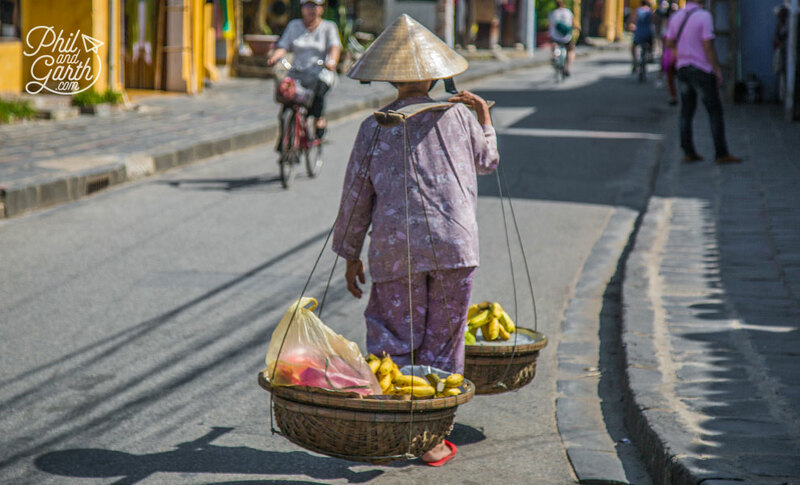 We’d definitely recommend getting up early to explore the Central Market, before Hoi An gets busy, especially if you’re into photography. You can eat breakfast here if you like, the food is cheap from the ladies with small stalls, even if they are a little pushy. Further into the market is the meat stalls, get ready for a shock as it’s nothing like what we’re used to! There’s no fridges, instead is meat piled up high on tables next to the sound of cleavers whacking wooden blocks. All the meat is divided up and every part of the animal appears on sale, like pigs snouts, it’s fascinating to witness and surprisingly there were no flies despite the appearance! 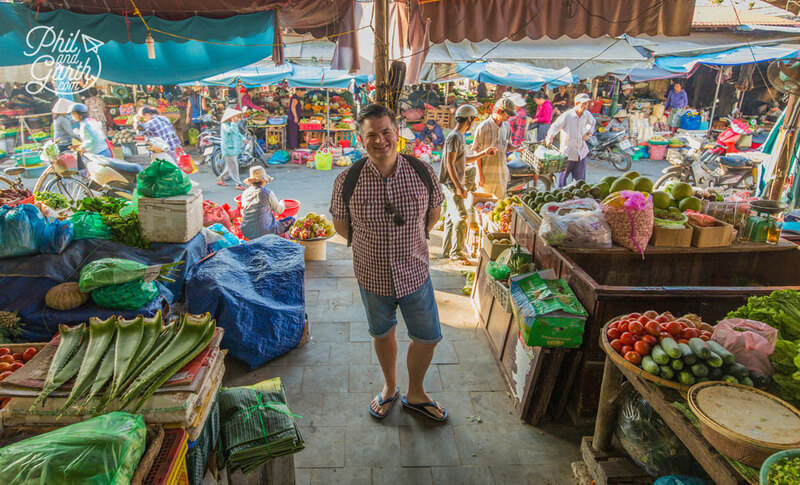 The next section is the a vegetable market, really colourful and busy we saw the vegetable they call ‘morning glory’ which is water spinach and the most common vegetable used in Vietnamese cooking. 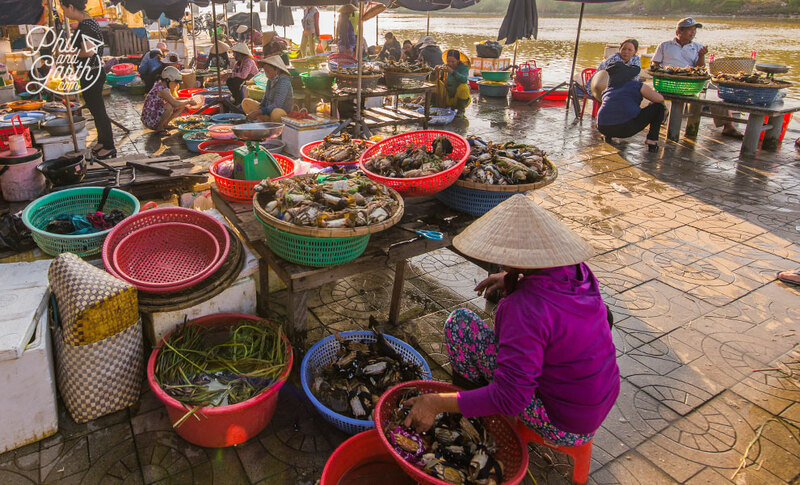 Then a few more steps away is the fish market right next to the river, with brightly coloured baskets full of live crabs. 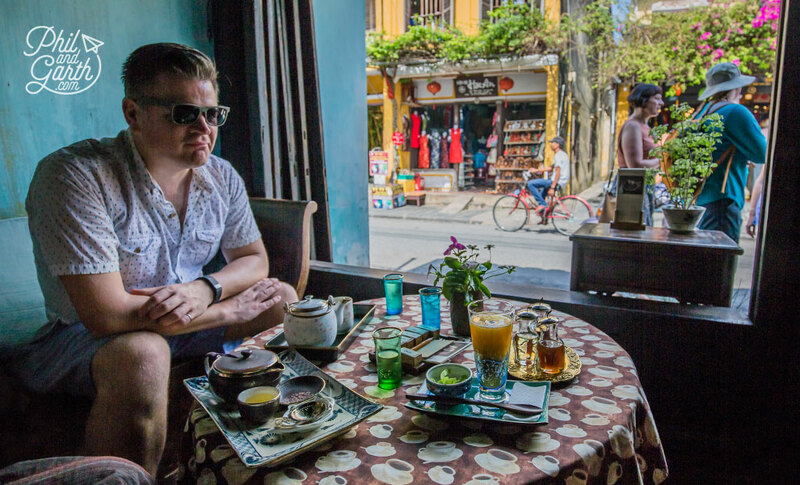 We tried the local signature dish of Cao Lau, usually eaten at lunch. 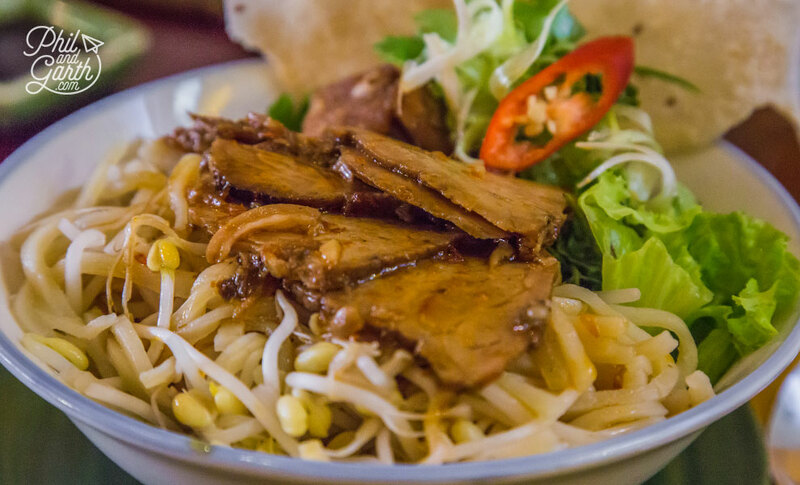 Barbecued pork, bean sprouts, mint and other fresh herbs with chewy and thick yellow rice noodles, and crispy croutons it’s really cheap at Morning Glory Restaurant which is considered to sell the best Cao Lau in Hoi An. Garth loved this dish and ordered it a few times. Morning Glory also had a range of cooking classes, so you may want to consider adding a lesson to your itinerary. 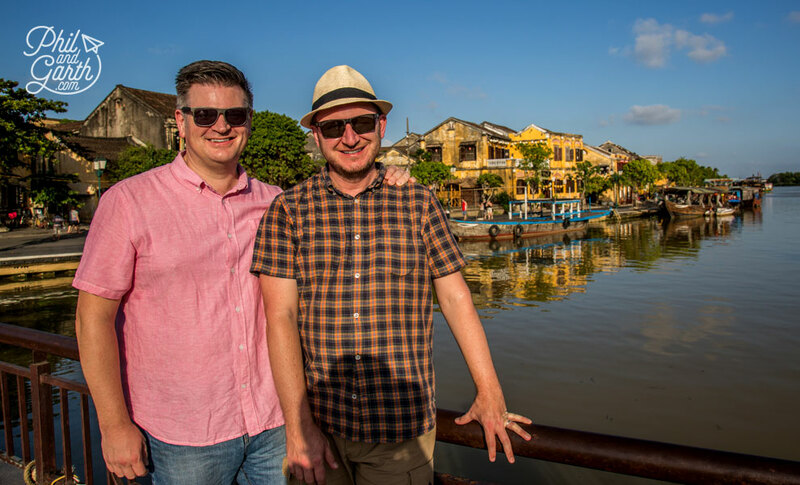 A couple more local dishes we tried in Hoi An were Com Ga – a rice dish with chicken, and White Rose – dumplings filled with either pork or prawns and topped with fried garlic with a sweet dip. Hoi An was food heaven! 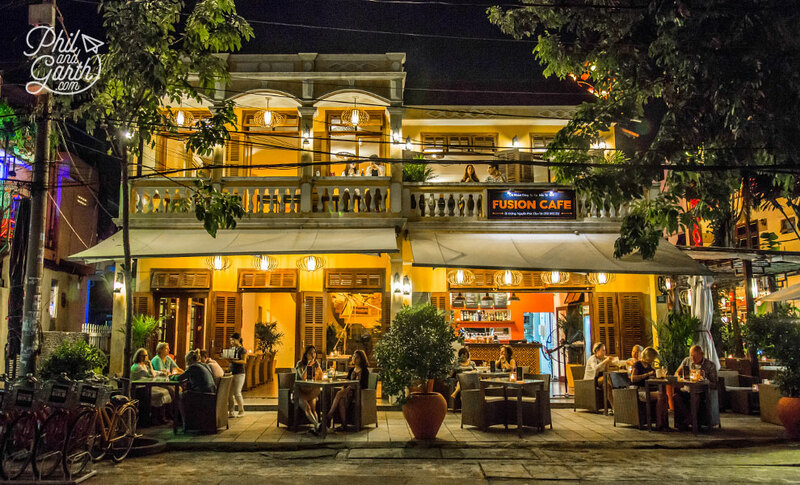 One evening we crossed the bridge to the opposite side of the river to Fusion Cafe. It’s in a great location as it overlooks the Old Town which is beautifully reflected in the water. 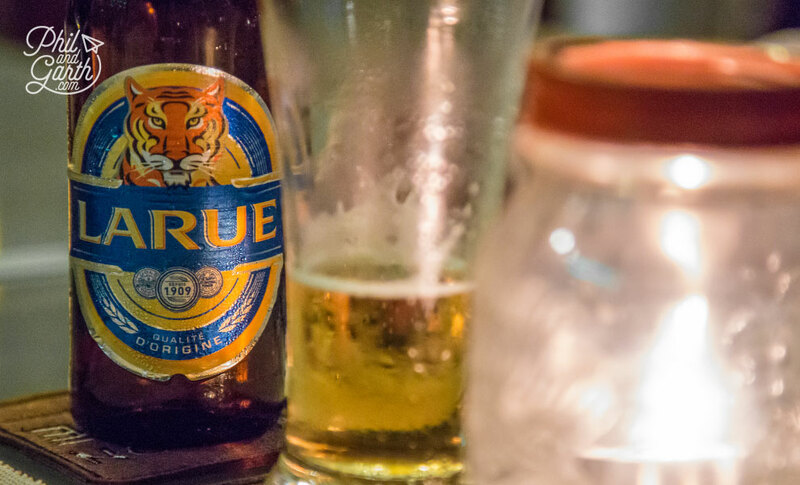 Grab a glass of Larue – the local beer and just sit back and people watch. 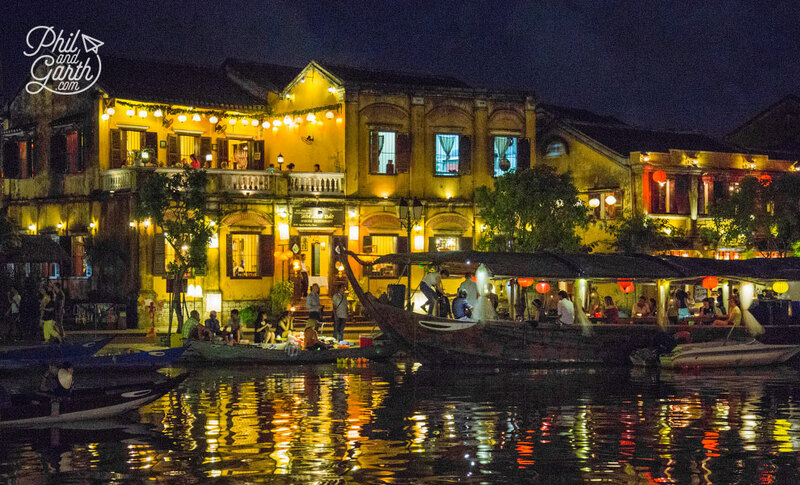 We’d also recommend Hoa Anh Dao Sakura, a restaurant in the Old Town on the waters edge. Make a reservation upstairs, over looking the river, like we did for an atmospheric night and listen to the sound of the locals playing a weird outdoor bingo type game next door, we still never worked out what it was. 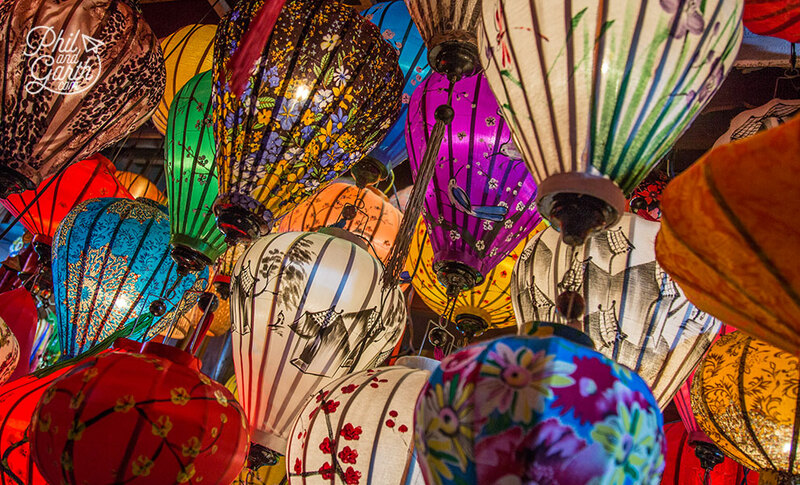 Our trip nearly coincided with The Hoi An Lantern Festival or known by locals as the Full Moon Festival, but not the ones you usually associate with Asia! 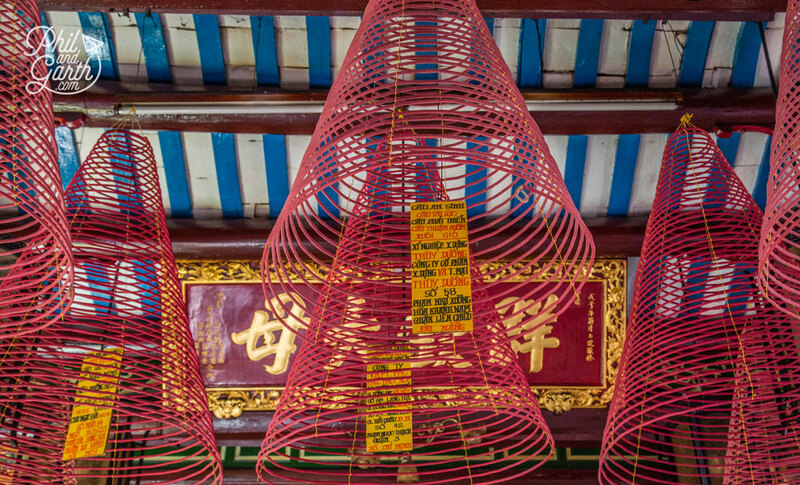 It’s when locals pay their respects to their ancestors by burning fake money, symbolising prosperity. 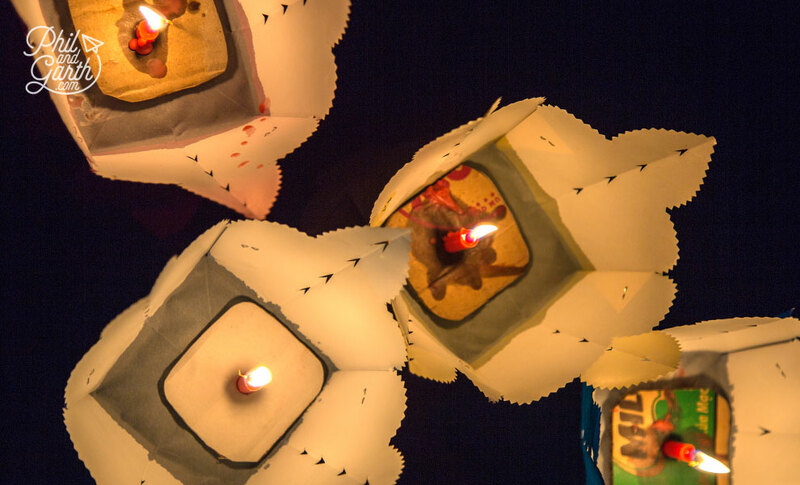 Our timings were out by a couple of days, which was annoying but there was still plenty of activity with people setting off paper lotus flower shaped cups with candles inside down the river. It’s on the 14th day of any lunar month. 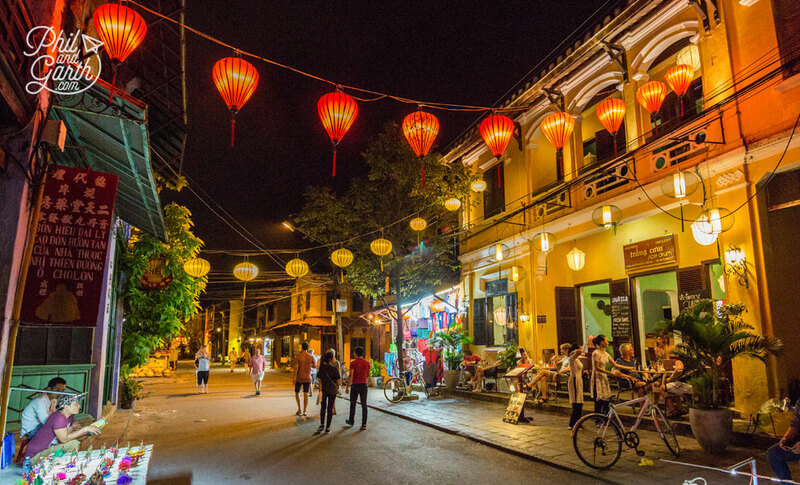 As day turns to night, Hoi An turns into an incredibly magical and romantic place where the whole town twinkles in a lovely warm glow. 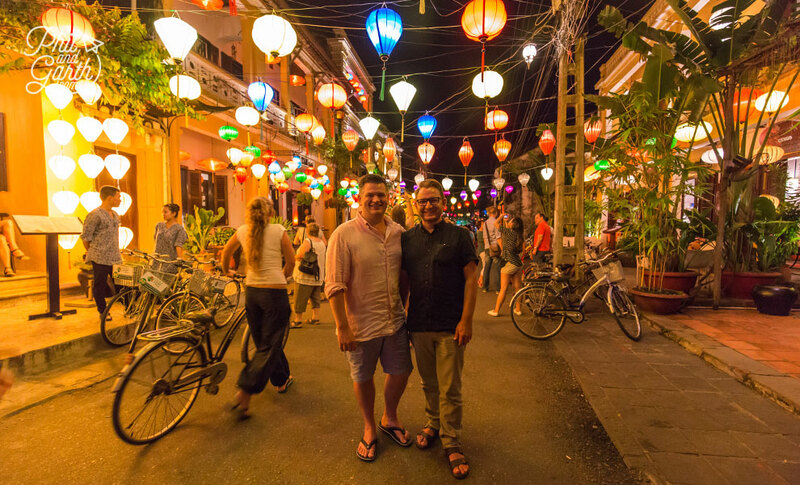 Although Garth felt these busy streets had an air of Disneyland about them, probably because they were full of Western tourists, so not quite as authentic as evenings in Hanoi. 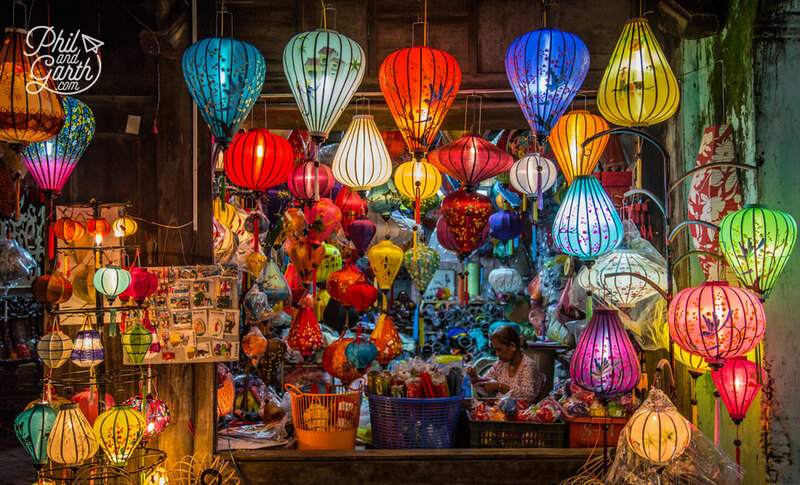 The shops selling the silk lanterns make for wonderful photos! they look so good all bunched together. They also make a perfect souvenir as most fold up, we weren’t too sure if they would work with our decor at home! but we should have just bought one, as they’re not expensive. Worth noting that all the shops close early at 9pm. 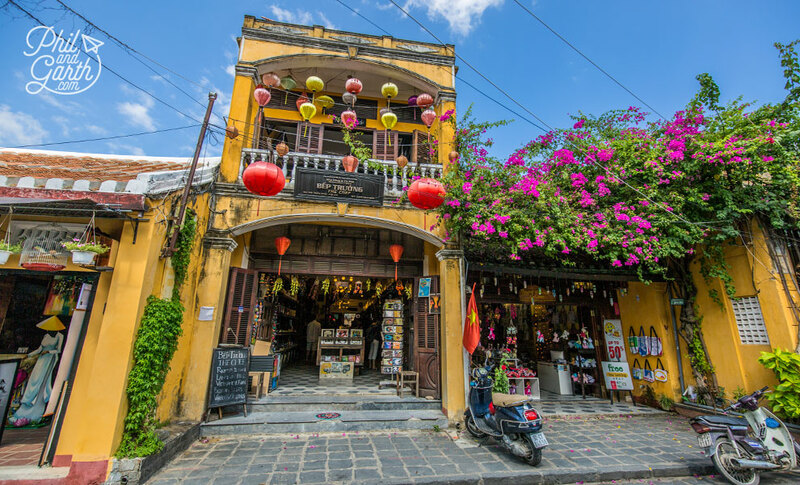 If you’re into shopping then Hoi An will be paradise for you! 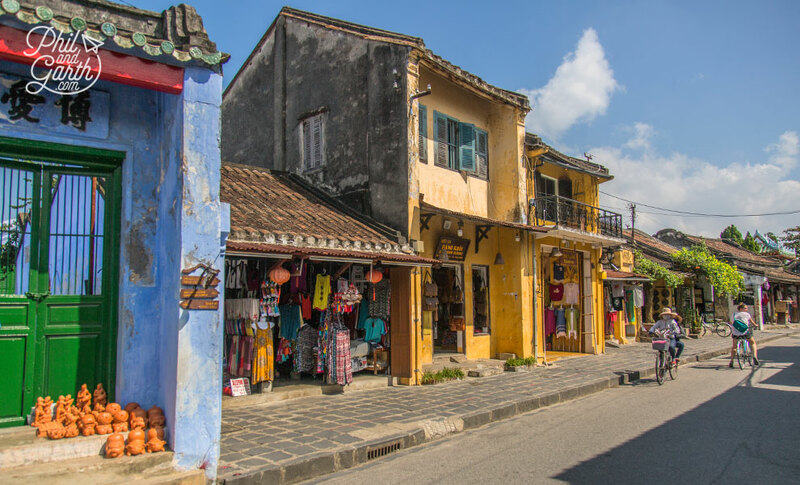 The Old Town is full of shops especially clothes shops as Hoi An is the tailoring capital of Vietnam. 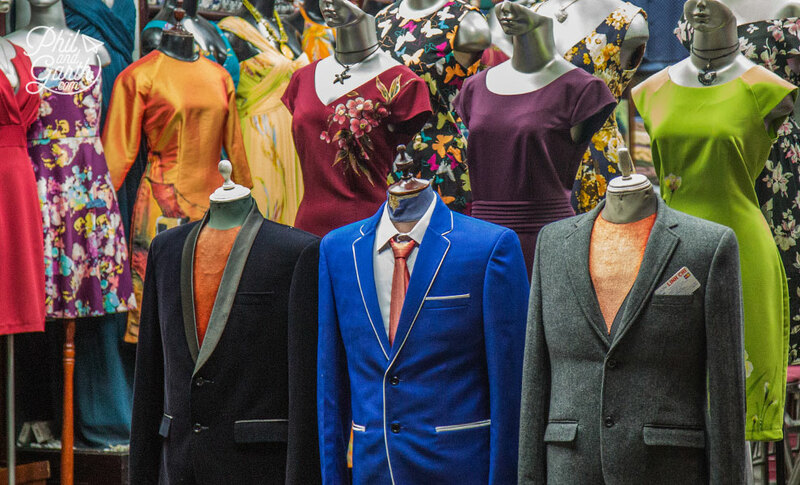 You can get a suit made in 24-48 hours, we noticed the quality varies dramatically between shops. Be prepared for a hard sell, as owners entice you to enter their shops, we felt a bit badgered after a few places. If you do want to get measured up give yourself 2 days to allow for fittings and just be careful it still fits after all that delicious Cau Lau! 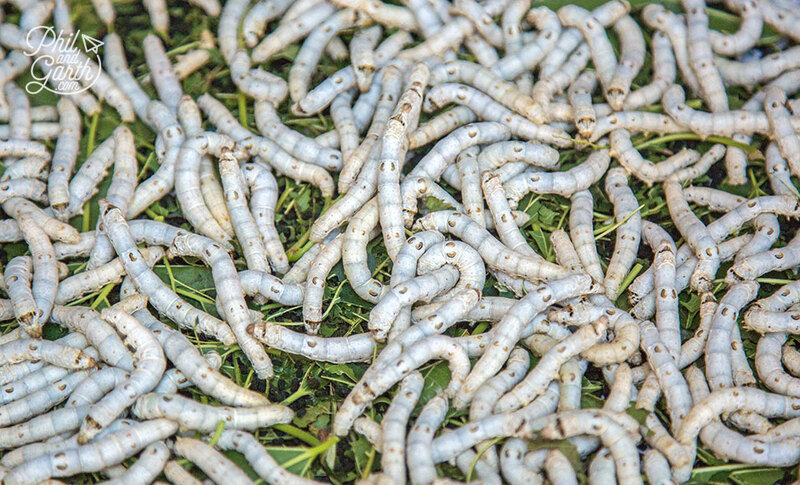 You’ll find loads of silk in shops Hoi An and if you want to see some real life silk worms then head to Ken Tam Cocoon on Tran Phu street, they sell some good quality silk scarfs which we bought as presents, Phil also liked their decorated coconut bowls for sale. 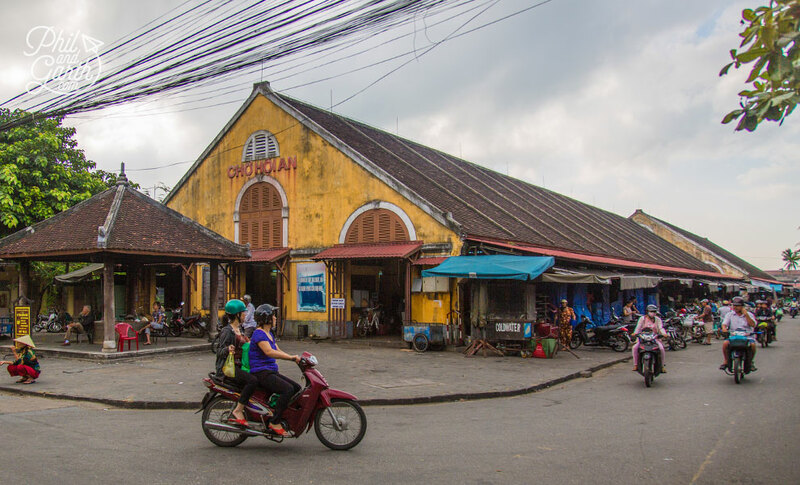 Garth loved the nearby Bep Truong – a coffee shop and bookstore selling old propaganda art and bought various posters. 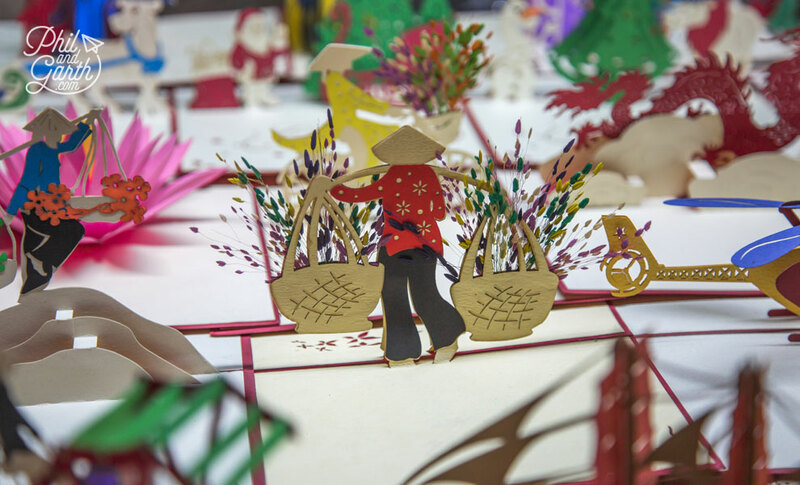 Reaching Out is a charming tea house where tea is served like an art form. 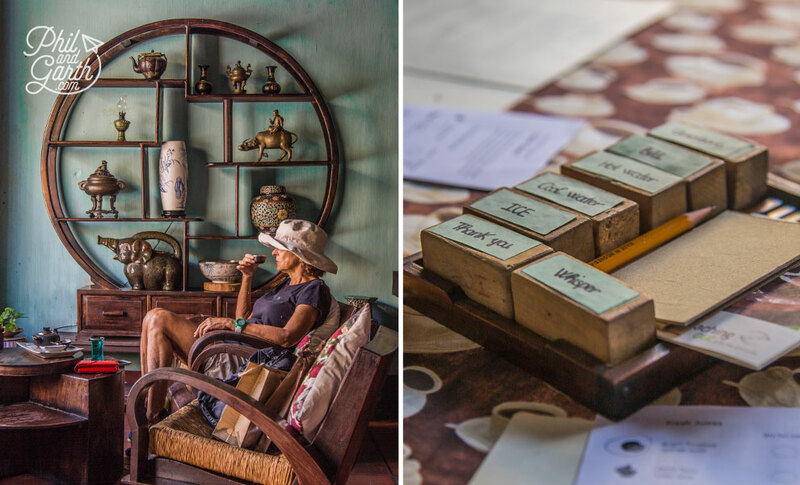 It’s also a charity (NGO) and supports disabled people, the tea house staff are hearing impaired or deaf so you use small wooden blocks to communicate. It was full of stylish people and was just lovely and tranquil. Reaching Out also have an Arts and Crafts shop – this shop is AMAZING, go there. It’s full of unique and tasteful things – homeware, clothes, all sorts. We bought a few items including a beautiful handmade silk bed runner. At the back of the premises you walk through the small workshop and see the artisans they are supporting hard at work. 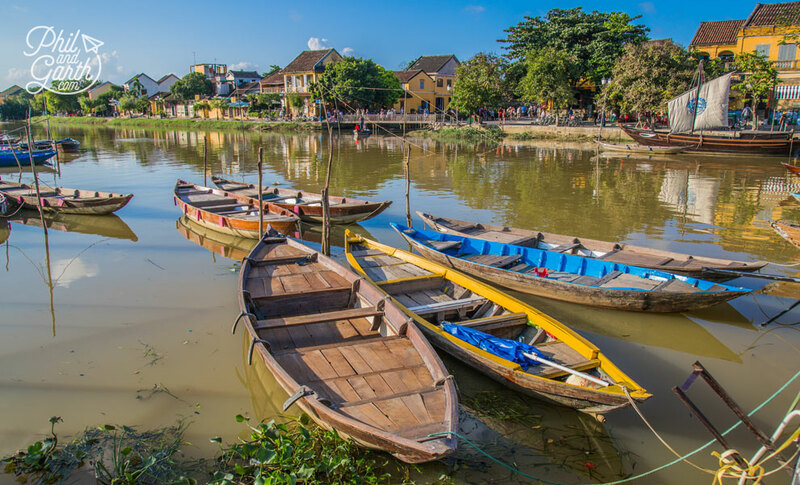 Hoi An was easily the most picturesque city on our travels through Vietnam. Although it’s a bit of a tourist trap, the charming old houses and pretty riverside make up for it. 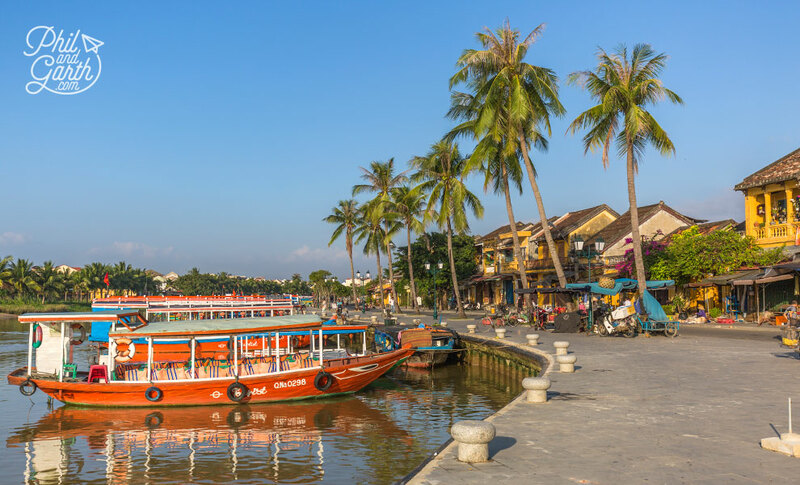 We would also recommend the hotel we paid for which turned out to be one of our favourites, Hoi An Historic Hotel it’s just a short walk to the Old Town and had a lovely rooms and a glorious pool which you will need in the heat! 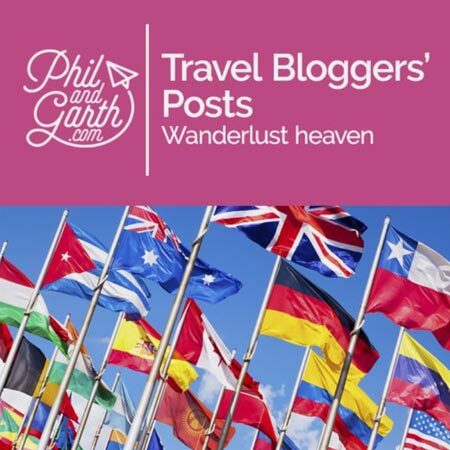 Tip #1: If you are visiting in November like we did, take a poncho just in case, as it’s the wet season. 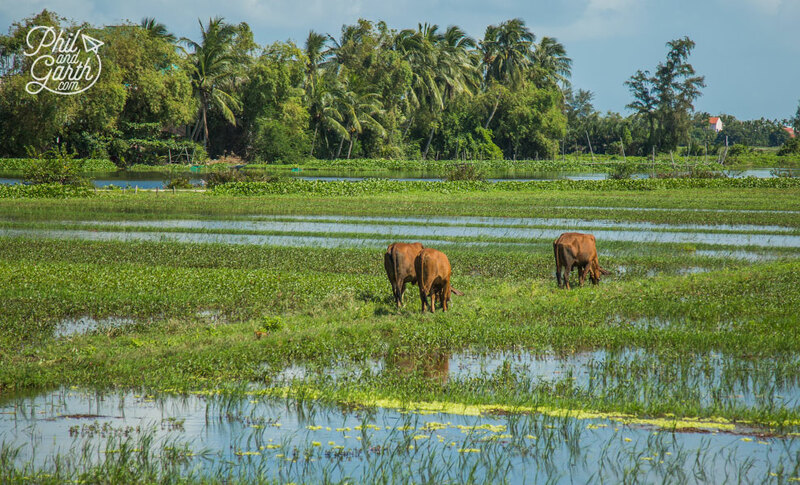 Tip #2: If you have more time – hire a bike from your hotel and go to the nearby countryside. Tip #3: Wander around at 7am before the shops open and tourists wake up. 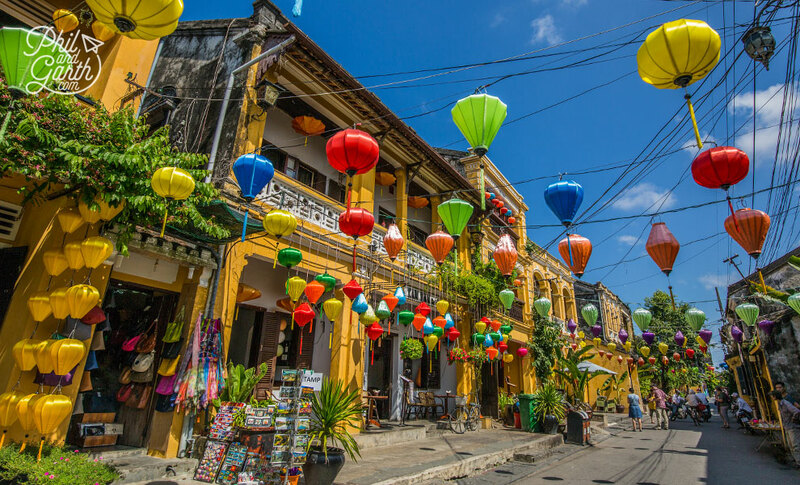 Tip #4: The town is easily walkable because it’s so small – so no need for taxis. Tip #5: Got even more time? 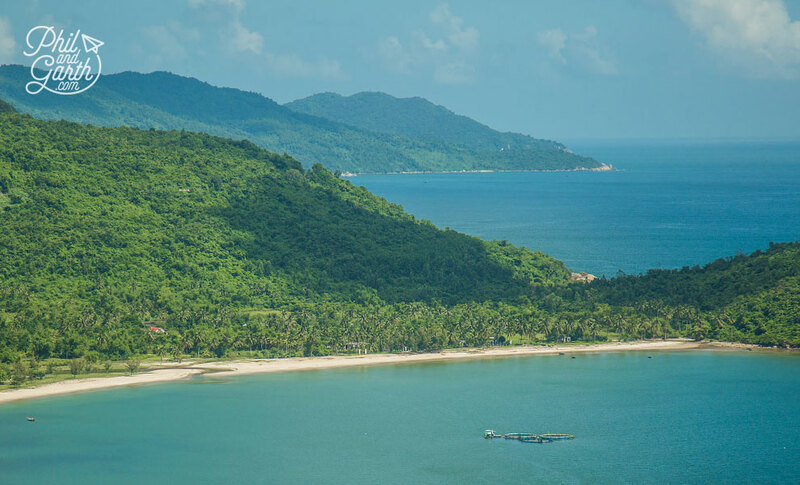 Go see the nearby ancient My Son ruins or the pristine white sandy An Bang Beach. Wow, so much here. GREAT photographs! 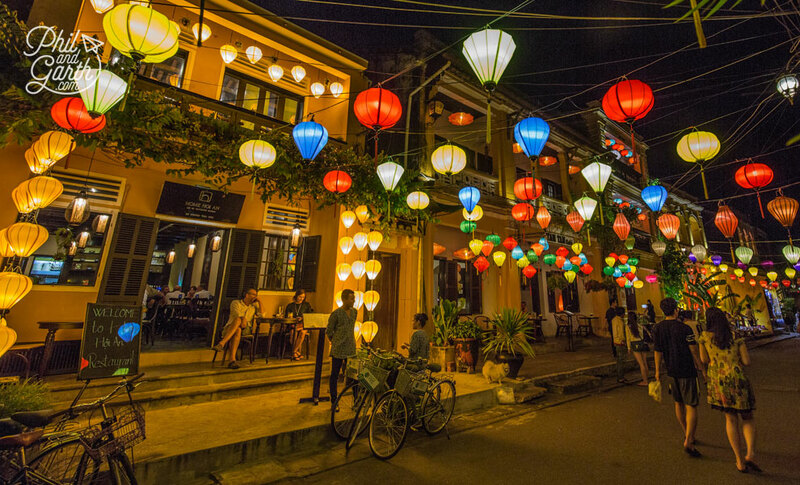 Love the lamps, the architecture, the food (Cao Lau!! ), the scenery…so much to fall in love with! 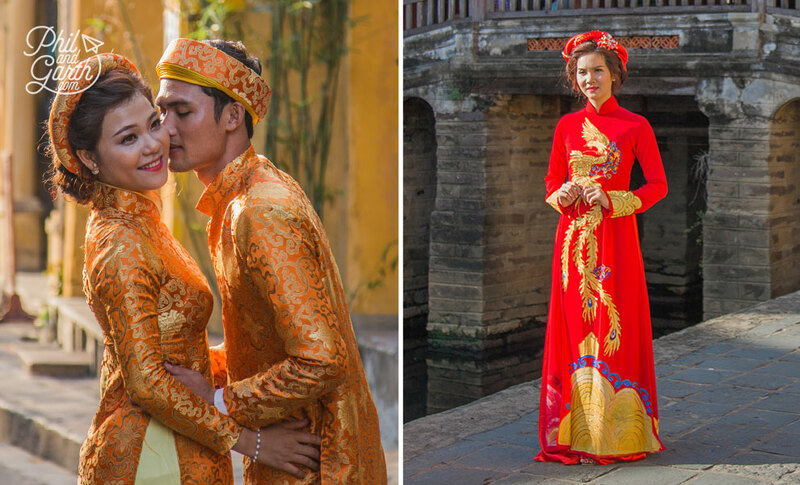 I’m glad you captured the couple in the formal wedding attire, and the girl (bridesmaid, I’m guessing). The formal dresses and suits are always so beautiful! Great photo essay, guys. 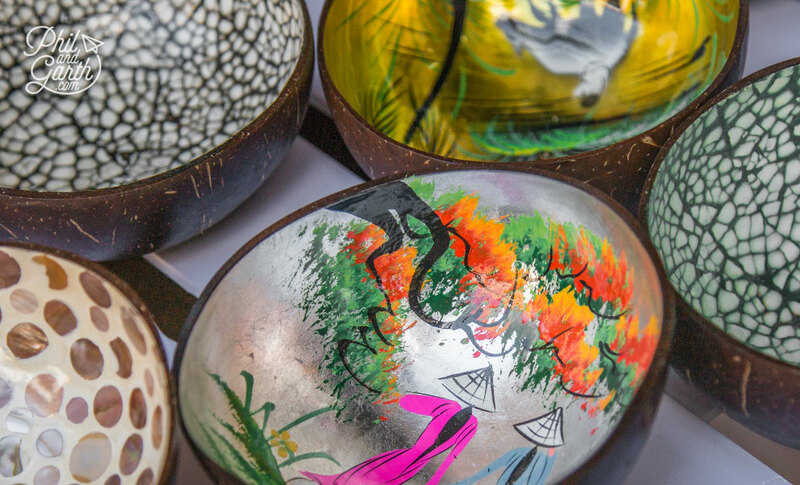 Really brings Hoi An home and makes us really eager to visit! 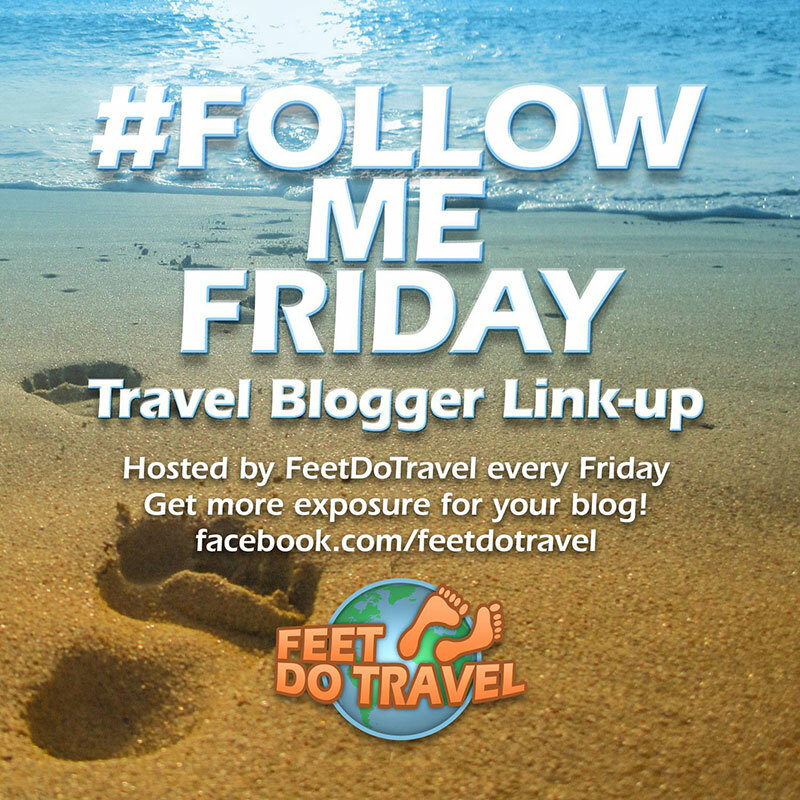 Great post, I am following all your posts about Vietnam, hoping to get there this year or the next one. 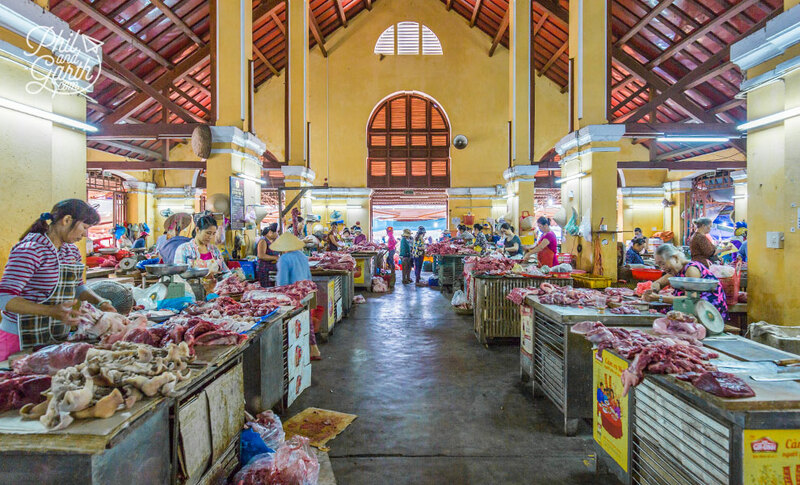 The market reminds me of Phuket market, where the meat was just pilled up, no fridges or anything similar. Everything looks so beautiful and full of life. 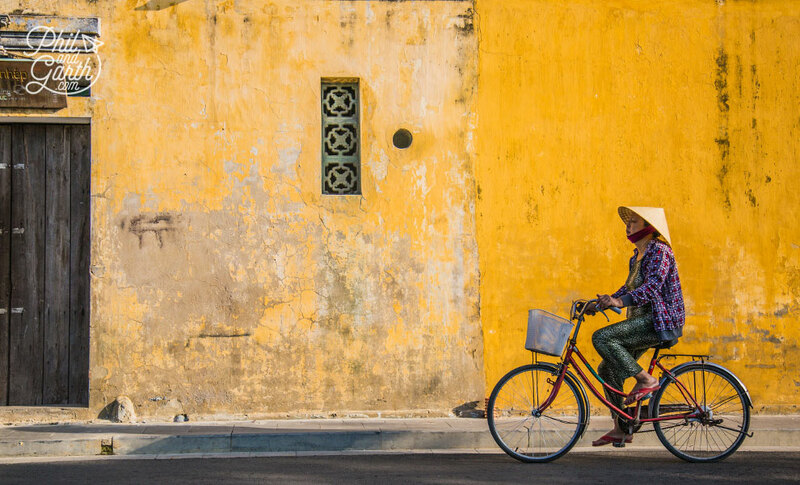 You managed to capture the soul of Hoi An in your photographs. Thank you for sharing. 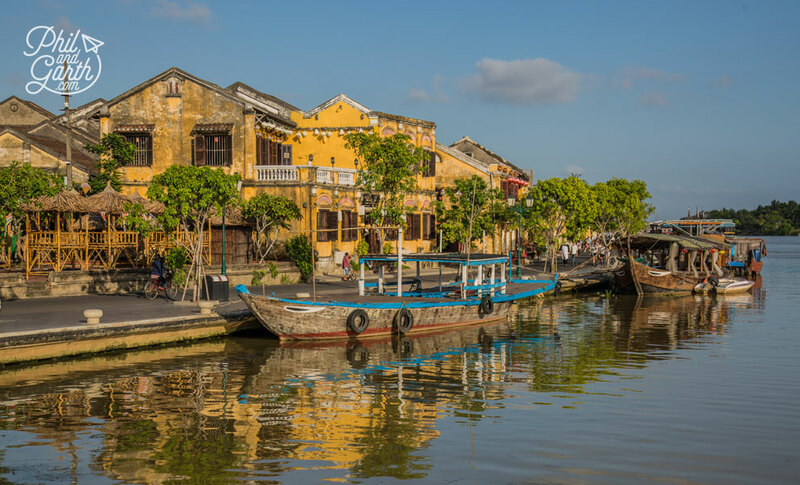 I loved Hoi An – we stayed in a modern hotel outside the historic town but I would love to stay somewhere closer next time. I loved the Japanese Covered Bridge and all the beautiful buildings with their European influences. 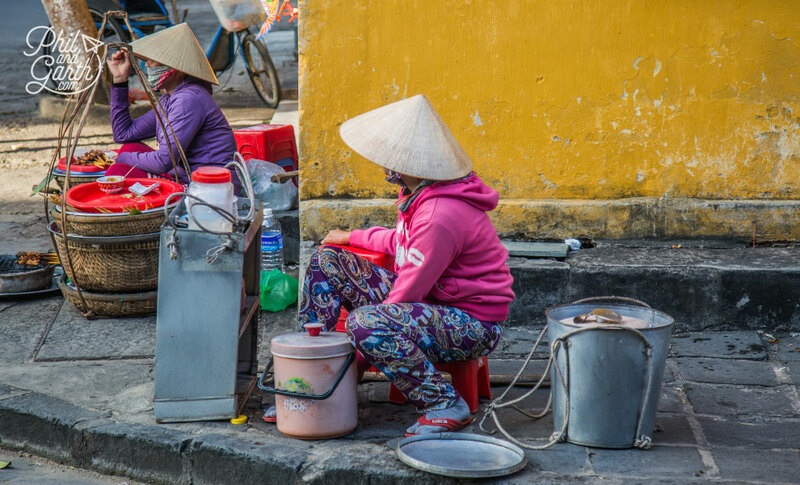 Would love to explore the Central Market properly next time and try even more food – you’d have to keep me away from those silk works as I would probably try to eat them! Absolutely love your shots of the street life – stunning look into the city! Wow! 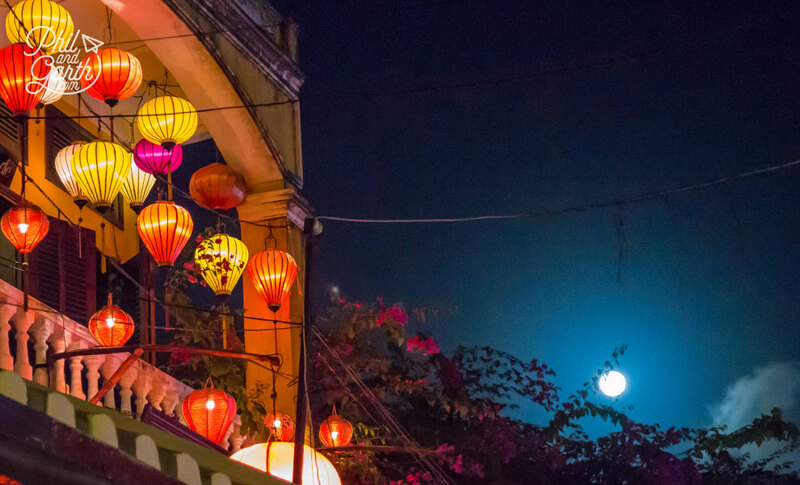 Hoi An looks really incredible. 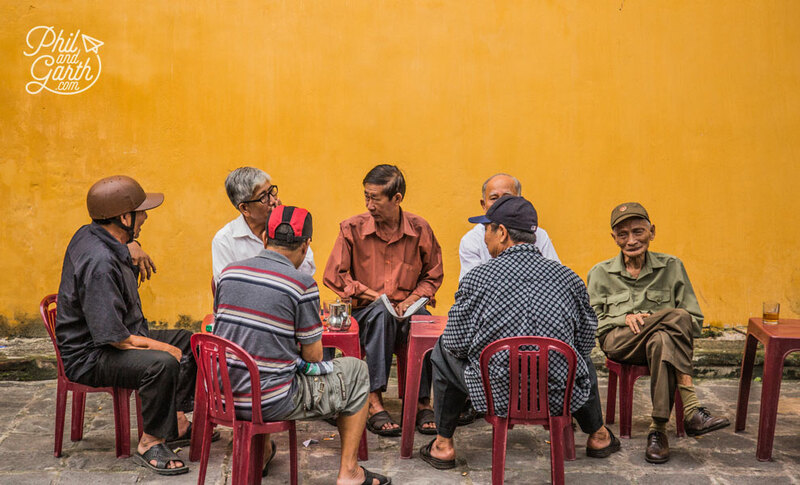 The more of these posts I read on Vietnam, the more I think this destination is rising on our travel list! 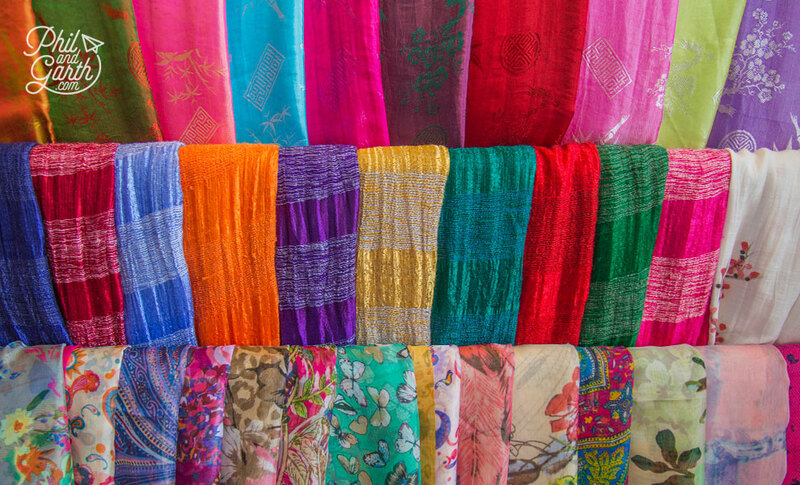 The vibrant colors, stunning countryside, and incredible handcrafted items (I can’t get over how much detail goes into those scarves or greeting cards!) just pull at me in a very alluring way. Thanks for the tips, guys! Definitely want to visit someday, so saving for future reference. 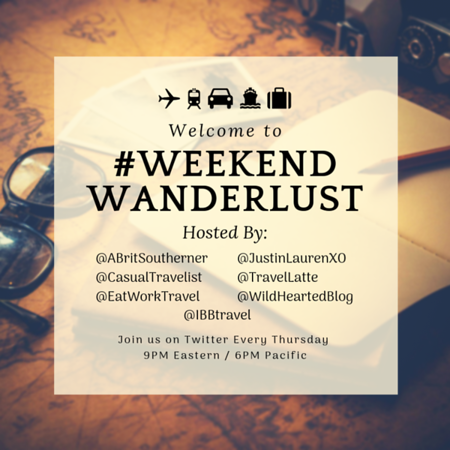 You have such a magical way of capturing the essence of the places you visit! 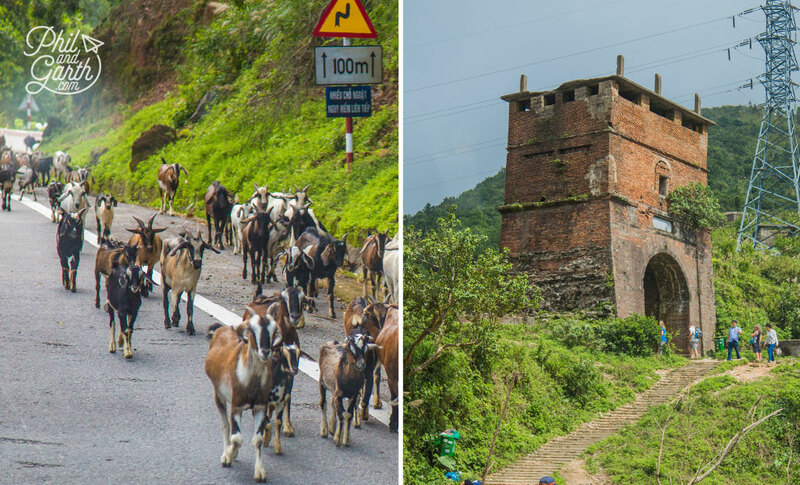 From the lush rolling hills to the vibrant colors of old town – this looks incredible!